The DNR is sponsoring Project AWARE again this year. The river trip from Mason City to Cedar Falls will start on June 14 and end June 21. A map of this year’s trip is here. Volunteers will spend one night at the famed Winnebago Scout Camp near Marble Rock. AWARE is an acronym for A Watershed Awareness River Expedition. Volunteers spend a week, or as much time as they can contribute, cleaning up an Iowa River. A description is here. This site is under construction. I hope to add information and contributors on various subjects. Leave a comment if you would like to see a topic covered, or if you live along the Shell Rock and would like to contribute to the blog. 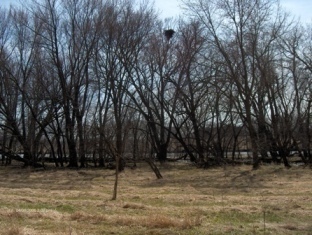 The first nesting pair of eagles came to Marble Rock, north of the bridge, in the spring of 2006. They raised two young birds. This photo was taken looking toward the river. The nest is approximately 5 feet deep and built near the top of a tall tree near the water’s edge. This year, another pair is building a nest in the City Park.